sassyfrazz: New Release DVD's from Lionsgate and HIT Entertainment! May 18th!! New Release DVD's from Lionsgate and HIT Entertainment! May 18th!! Lionsgate and Hit Entertainment just came out with two new DVD's today! My kids really enjoy these shows, and I am happy to share them with you. It can be a challenge to find good shows for our kids to watch. Thomas & Friends - "Emily and the Garbage"
Bob the Builder - "Lofty's Banana Tree"
Barney - "Making A Move"
Fireman Sam - "Norm's Invisible Friend"
Bonus Episode: All new CGI Angelina Ballerina - "Angelina's Dance Partner" - Angelina finds a creative way to work with a new dance partner. This DVD is geared toward ages 2-5 years old. "Barney: Let's Play Outside" -perfect for this time of year! It's a super dee-duper day in the sun playing ball, skipping rope, going on a camp out and just enjoying the warm weather when Barney™: Let's Play Outside springs onto DVD May 18, 2010 from Lionsgate and HIT Entertainment. Featuring never-before-seen content and fun adventures, this fully-loaded DVD will bring smiles to little faces everywhere and encourage young kids to go play outside. Trusted by moms and adored by children, Barney displays sharing, caring, imagining, dancing and learning on television, online and through live events, home entertainment and publishing. The Emmy award-winning series, Barney & Friends is one of the top-rated preschool shows today, airing on PBS KIDS® and PBS KIDS SproutSM. 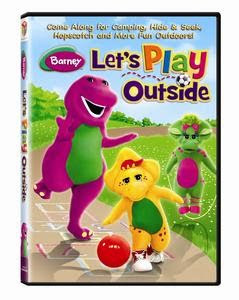 Join everyone's favorite purple dinosaur and his playground friends as they branch out under the sun and stars to fill each day with outdoor fun adventures in Barney: Let's Play Outside. Whether it's imagining shapes in the clouds, eating ice cream, fishing, singing songs around a campfire or catching lightning bugs, Barney, Baby Bop, BJ and the rest of the gang celebrate the warm weather and let their imaginations soar! This DVD is geared toward ages 1-5 years old. Check out all the other Lionsgate and HIT Entertainment DVD's! I received these two DVD's for reviewing purposes from Lionsgate and HIT Entertainment. I was not compensated for my time or written review. They have provided me with the DVD's and information to share with my readers. Wild Creations: EcoAquarium Review & Giveaway!! Sonicare for kids! A great toothbrush!! The Pulse Slither is the Ultimate Scooter!